So they flew over Indian Naval base (Andaman) and the Indians didn't see it? Yangon, Chittagong, or Kolkata radars couldn't catch it either? I would imagine the old military Volume Search Radars are rarely turned on given low current threat perception and their high power and maintenance costs. !!! !Wreckage Found Near East Pakistan!!!! Rajiv what have you done!! Sir I thought the plane was hijacked by sea pirates ! Australia dismissed the claim, however, Bangladesh sent 2 planes in that region to search for the missing jet. The Malaysia Transport Ministry released to the public a preliminary report on the missing airliner. The report was sent to the International Civil Aviation Organization, the U.N. body for global aviation. LONDON: The missing Malaysia Airlines’ flight MH370 was shot down during a joint Thai-US military training exercise and then was the subject of an elaborate international cover-up – according to a book released about the lost plane that has caused anger among relatives of those on board. Tomorrow, just 71 days after the Boeing 777 vanished en route from Kuala Lumpur to Beijing, Flight MH370: The Mystery will go on sale in Australia, the Sun-Herald reported. It has been written by the Anglo-American journalist and author Nigel Cawthorne. Cawthorne introduces his book by claiming that the families of MH370’s passengers will “almost certainly” never be sure what happened to their loved ones. But he goes on to support one theory, based on the eye-witness testimony of New Zealand oil rig worker Mike McKay, that the plane was shot down shortly after it stopped communicating with air traffic controllers. At the time there was a series of war games taking place in the South China Sea, involving Thailand, the US and personnel from China, Japan, Indonesia and others, and Cawthorne has linked this to Mr McKay’s claims to have seen a burning plane going down in the Gulf of Thailand. “The drill was to involve mock warfare on land, in water and in the air, and would include live-fire exercises,’’ Cawthorne said. “Say a participant accidentally shot down Flight MH370. Such things do happen. No one wants another Lockerbie [Pan Am flight 103 by terrorists in 1988 allegedly in retaliation for a US Navy strike on an Iranian commercial jet six months earlier], so those involved would have every reason to keep quiet about it.” Cawthorne then suggests that “another black box” could have been dropped off the coast of Australia to divert the efforts of search teams. “After all, no wreckage has been found in the south Indian Ocean, which in itself is suspicious,” he wrote. The UK satellite company Inmarsat has told the BBC that the search for the missing Malaysia Airlines jet has yet to go to the area its scientists think is the plane's most likely crash site. 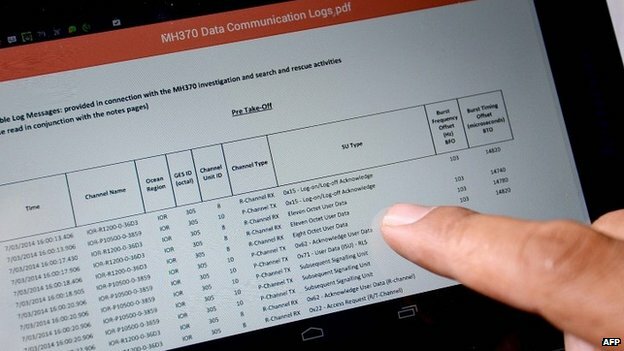 Inmarsat's communications with the aircraft are seen as the best clues to the whereabouts of Flight MH370. The hunt for the lost jet is currently taking a short break while ships map the Indian Ocean floor. When the search resumes, the Inmarsat "hotspot" will be a key focus. But so too will a number of areas being fed into the investigation by other groups. Australian authorities are expected to announce where these are shortly. The BBC's Horizon TV programme has been given significant access to the telecommunications experts at Inmarsat. It was the brief, hourly electronic connections between the jet and one of company's spacecraft that are currently driving the search. Inmarsat's scientists could tell from the timings and frequencies of the connection signals that the plane had to have come down in the southern Indian Ocean. An Australian naval vessel was sent to investigate the region west of Perth, and followed up leads as they emerged. But as Horizon reports, the Ocean Shield ship never got to the Inmarsat hotspot because it picked up signals some distance away that it thought were coming from the jet's flight recorders. The priority was to investigate these "pings", and two months were spent searching 850 sq km of sea bed. Ultimately, it turned out to be a dead end. "It was by no means an unrealistic location but it was further to the north east than our area of highest probability," Chris Ashton at Inmarsat tells Horizon. The company's experts used their data to plot a series of arcs across the Indian Ocean where its systems made contact with the jet. By modelling a flight with a constant speed and a constant heading consistent with the plane being flown by autopilot - the team found one flight path that lined up with all its data. "We can identify a path that matches exactly with all those frequency measurements and with the timing measurements and lands on the final arc at a particular location, which then gives us a sort of a hotspot area on the final arc where we believe the most likely area is," said Mr Ashton. 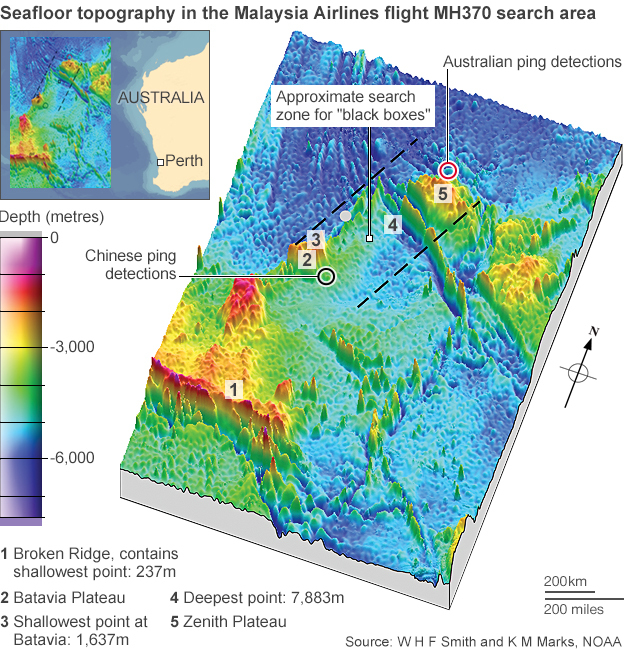 The Australian authorities leading the hunt have now recognised the need to make a high-resolution bathymetric (depth) survey of the wider search zone - some 60,000 sq km in area. This is likely to take several months, but once they know precisely the shape of the sea bed and the height of the water column, they can then better choose the most appropriate vehicles to continue the underwater sweep. MH370 was lost on 8 March en route from Kuala Lumpur to Beijing. A total of 239 passengers and crew were on board. BBC Horizon: Where is Flight MH370? will be broadcast on BBC Two at 2100 BST on Tuesday, and will be available on the iPlayer thereafter. 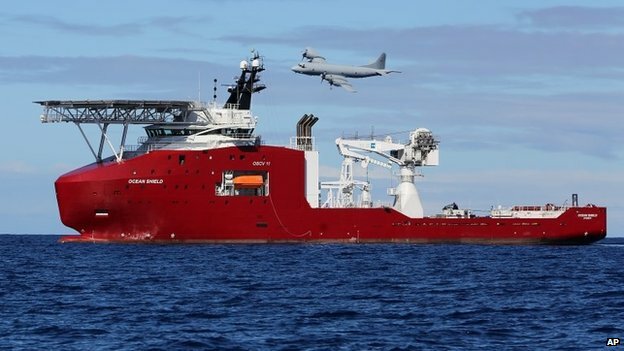 Malaysia will send more equipment to the southern Indian Ocean to join the search for flight MH370 which went missing four months ago. Defence Minister Hishammuddin Hussein said yesterday that a Malaysian navy ship equipped with a multi-beam echo sounder - a device to map the ocean floor - would set sail on August 4 for the deep-sea search zone far off western Australia. State energy firm Petronas, together with Deftech and Phoenix International, would deploy a towed device called a synthetic aperture sonar to scan the ocean floor, he said. Shipbuilder Boustead Heavy Industries, together with iXBlue Australia, would send a deep towed side scan sonar with a remotely operated vehicle. "Instructions for immediate mobilisation have been given and the assets are expected to reach the search area in mid- August," Hishammuddin said. 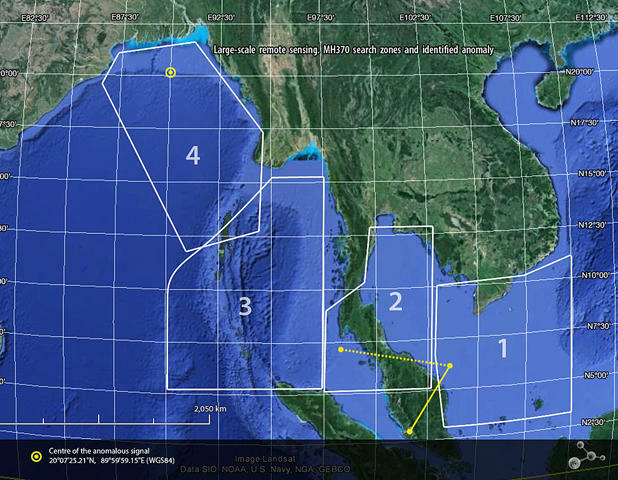 Another Malaysian vessel which was deployed in April would stay in the search area,. The Malaysia Airlines flight lost contact on March 8 en route from Kuala Lumpur to Beijing with 239 people aboard. It is believed to have veered off course and - based on satellite data analysis - crashed in the southern Indian Ocean, but an extensive Australian-led search has so far found no sign of wreckage. Australian officials announced last month that the search would shift further south based on a review of the satellite data. They also said the Boeing 777 was almost certainly on autopilot when it ran out of fuel and crashed. The most likely scenario, the officials said, was that the pilots and crew suffered from hypoxia, or lack of oxygen, and became "unresponsive", which can occur when a plane loses air pressure at high altitude. The underwater search will start in the new area, covering up to 60,000 square kilometres in the southern Indian Ocean, next month and take up to a year.